A sublime moment of political incorrectness. Gentlemen from the left: HRH Prince Philip, the Duke of Edinburgh, Christian Furr, at 28 the youngest artist ever to have painted the Queen, Ian Clarke, one of the finest Chancery barristers, the author Michael Moran laughing in his usual immoderate manner, Jean Francois Dor, a tireless socialite and Chairman or Vice-Chairman of a number of distinguished London Clubs. As you know I was recently elected as a full member to the resuscitated Eccentric Club originally established in 1781 to promote 'The feast of reason and the flow of soul' in an atmosphere of good fellowship. Any discussion of religion, politics or business is frowned upon. What an excellent idea! 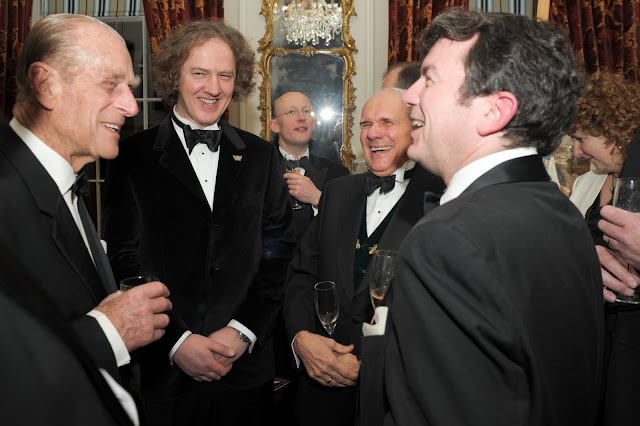 A small group of us had dinner with HRH Prince Philip (the club's patron) on February 17th at the Arts Club in Dover Street, London W1. The guests were a fascinating bunch - some illustrious and wildly successful but genuinely and democratically clubbable. It was great fun as I am no advocate of political correctness - it has neatly removed all the poetry, charm and humour that made life worth living. In the photograph I am enjoying something terribly non-pc said by Prince Philip. He is very charming and softly spoken - quite at variance with his gritty media image. The Royal Family are finer featured than their appearance on television would indicate. I had imagined Imants von Wenden, the initiator of the revival of the club, to be a glamorous blonde East-Central European female. Shows how my mind works! He turned out to be a handsome, rather burly publisher, photographer and artist with a pony tail married to Svetlana, a Russian businesswoman. He is to be congratulated on this venture. 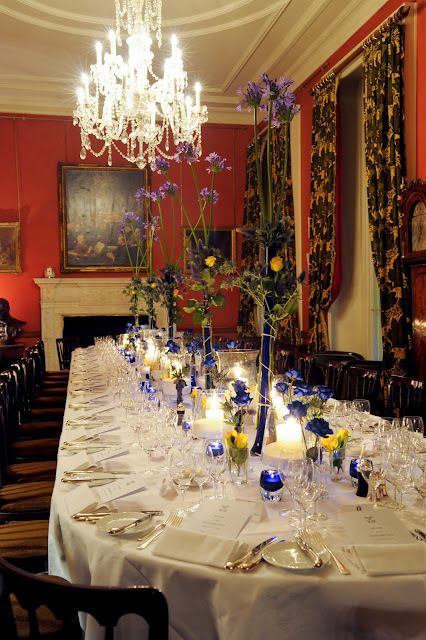 The simple yet excellent dinner, the glamorous Russian concert pianist playing Chopin (Veronika Ilinskaya) and elegant table setting at the Arts Club in Dover Street made for a superb occasion. I met after a long absence one of my favourite bestselling literary travel authors and good friend Tahir Shah (The Caliph's House) who proposed me for membership. He lives in a palace in Casablanca. And I made some new friends. Today though we are a long way indeed from the early days of the club when witty and iconoclastic 'staring and despising' took place at the 11.00 am dances in the eighteenth century pleasure gardens of Vauxhall and Ranelagh 'Picking off cherries and God knows what else' to paraphrase Pepys. You might be amused to read if you have a few loose moments http://www.eccentricclub.co.uk/.